My buddies were out there today in our 26′ cuddy cabin and they had a good day…they released 4 sailfish, kept 2 nice mahi mahi and also released a 175 pound striped marlin. My buddy that is heading back to the states hooked and reeled in the striped marlin so he got his fish the day before he goes back to the states. They fished about 30 to 35 miles out…the seas were calm. There were 5 or 6 other boats fishing in the area. The 36′ Express released a striped and a blue marlin and 4 sailfish today…they also added amahi mahi for the fish box. The 28′ Center Console did a half day trip and caught a half dozen yellowfin tuna in the 20 to 30 pound ranges well as a 50 pound Pompano. The rain we had earlier this week was caused by the tropical storm that is now pushing through Guatamala. 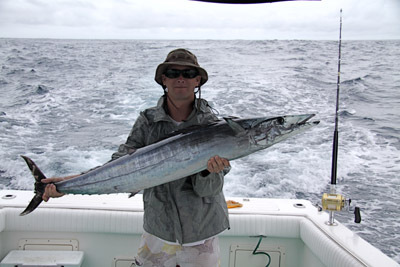 The past couple days have been sunny and dry and the fishing out of Los Suenos marina was good today. Today the guys on the 35 flybridge released 2 blue marlin and 4 sailfish about 30 miles offshore. They also caught a nice mahi mahi for the dinner table. The captain said the ocean was calm and the weather nice. Our boat is going out there tomorrow and hopefully they get a couple big ones. My buddy goes back to the states this week so he is trying to get a marlin before he goes. After a couple days with non stop rain we woke up to sunshine and 85 degrees today and hopefully things will get back to normal. The 43′ went out from Los Suenos yesterday and he said it was miserable…cold, rain and 6 to 8 ft swell. 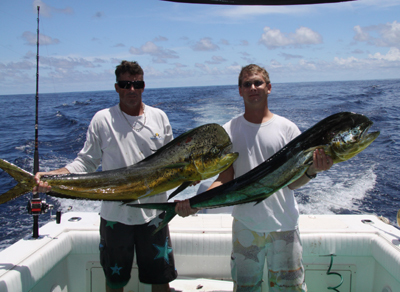 The went 0 for 3 on sailfish and they caught 2 nice mahi mahi. It’s been non stop rain all day today and the SAT map looks like it could be this way for the next few days. By late night CNN weather was talking about the tropical depression off the coast of Central American and how it was going to dump a lot of rain on us. We normally do not have rainy days even during rainy season. Most of our rain comes as evening showers. This has not been a normal week. The group that went out today on the 42′ in the heavy rains ended the day with 2 sailfish release and 2 mahi mahi for the grill. We should know in the next 24 hours if this “top kill” thing is going to work and stop the oil leak in the Gulf…keep your fingers crossed. Yesterday in my report I said the 42′ would “get some sails, tuna and maybe a marlin” on the full day trip they had today. The captain called me on the way in and they released 5 sailfish and the went 2 for 4 on striped marlin. They also caught a couple nice yellowfin tuna for the dinner table. It was rough and crappy weather by our standards but not bad fishing. My buddies hit the 26 rock for the 3rd day in a row in our boat and caught 20 or so fish including a few nice wahoo, a couple different types of snapper, some small yellowfin and more. They said it was rainy and crappy almost all day. The 36′ Topaz went across the bay to Negritas and caught a couple nice roosterfish. We have a couple groups going offshore the next few days on the 42′ Maverick so I am anxious to see how they do…my guess is they get some sails, tuna and maybe a marlin. I did talk to the captain of the 42′ late night and today they had 7 sailfish bites and a marlin bite. The fish were biting odd and they ended the day with just 2 sailfish releases. They also caught a nice mahi for the box. My buddies went to the 26 again today and had a near repeat of yesterday. Lots of action all day long with a few wahoo, some small yellowfin and so many tuna mackeral that they got tired of catching them. They went through 25 ballyhoo so they had a bunch of bites. They also had a couple good bites dropping down dead baits on the rock…fish that bite 10 pound bonitas in half. They are going again tomorrow. They did say the ocean was rough again today. My friends took our boat down to the 26 rock yesterday and did pretty good. They caught a handful of nice wahoo, a handful of tuna mackeral, a 20 pound yellowfin tuna, a 20 pound mahi mahi and more. It was a little rough because we have had a huge swell all week and some rain offshore. 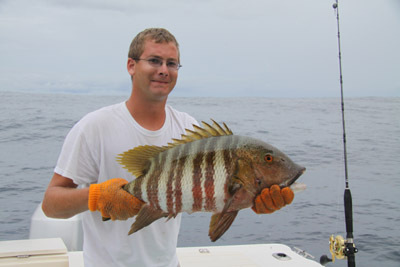 You are currently browsing the Costa Rica Fishing Reports blog archives for May, 2010.